The Samsung Galaxy Note 9 is Android's heavy-hitting hero for 2018 — with a Snapdragon 845, 8 GB of RAM, the Samsung Experience UI with its insane package of features, including the desktop experience platform DeX, and the option to go for 1 TB of storage by combining a 512 GB Note 9 unit with a 512 GB storage card. Its price starts at $999 but, with how much the Note 9 can do, a lot of users find this price to be justifiable. Then, we have the iPhone XS Max, which starts at $1,099 and is Apple's Plus version of the iPhone X form factor. It has a thin bezel, a stainless steel frame, it looks modern and awesome, and is — of course — the fastest iPhone ever. With Apple's track record of timely updates and supporting its mobile devices for 4+ years after release, it's not that hard to justify dropping $1k+ on an iPhone, too. Yeah, it's an insane price, but the market as a whole was quick to boost its prices and — intead of leaving Apple look like it's a lone wanderer stuck on Mount Overprice — it kind of made the iPhone prices look OK. The Xperia XZ3 costs $900, the Galaxy S9+ costs $930, the Note 9 costs $1,000, so on and so forth. 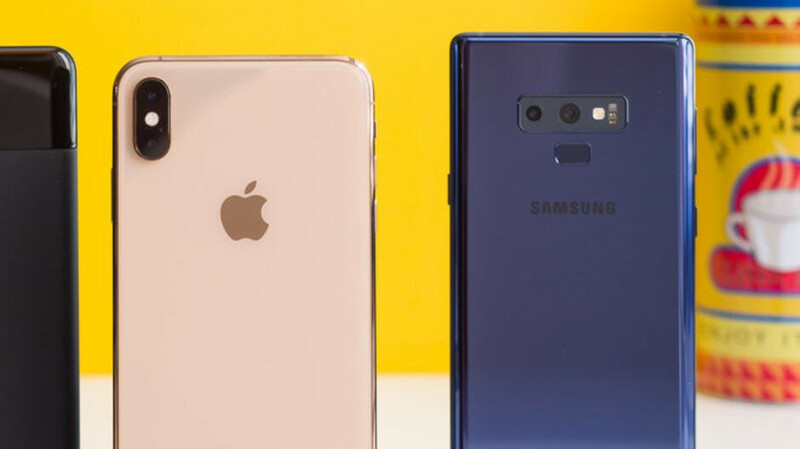 So, we figured we'd ask you: for that kind of money, would you buy a Note 9 or an iPhone XS Max? Well... do the poll results surprise you? No it doesn't surprise us , it only surprise PhoneArena. Don't fool yourself, these results are only because a very large part of this site's audience is made by Indian people, which is not a bad thing but it's in no way representative of reality. If you take the world as a whole this poll would not change very much. Apart from the US the majority do not like iPhones. Nowhere near as popular as Android phones. Perhaps you need reading comprehension lessons. This poll have zero meaning, XS Max will sell atleast 4-5 times more than Note 9. 20% depreciation on these phones by Sept 2019 if they are nearly in mint condition. You can still make a lot of money. Note 9 is lucky to sell for $500 next year. And why would anyone care about that when most note owners do trade in yearly? In my place they sell note 9 with Samsung smart tv as gift!. From Day 1 you buy your iPhone you already consider selling it?! Oh my! And Note 9 owners will still have the best large phone on the face of the earth. Who is appel? Were you trying to spell appeal? Apparel? Able? Phone Arena really needs to quit being cheap & upgrade the comment section to Disqus. SMH @ this comment section. Funny since android phone price drop within less than 6 month. That doesn’t make it a better phone, and how many do you own? I own both, which qualifies me to speak on both, you’re simply trolling. There’s not a better phone on the market than the Note 9...Max included. You already know how these imbeciles do. 2 coworkers of mine have the XS Max & it is a damn good looking phone! Of course, my preference is Android OS but the build quality of the XS/Max is amazing! Awesome build quality, and a very good and capable device. I love both, but I think the Note 9 is head and shoulders above the Max, and everything else out there. Don’t get me wrong though, the Max is tite. I just wish Apple would take advantage of the screen size, and hardware of it...they don’t. Depends on what you are looking for. The note 9 will get the next version of android but probably not the version after that. Some people swear by the s-pen I found it a fun toy when I had my note 8. After a week I never used it. Split screen apps sounds great but I don't know how much I will really use it. Siri Shortcuts on the other hand I will use a ton once apps support it. Not knocking the note 9 by any means for some people it is the better choice. I think it all comes down to preference both are great phones. Now that’s a post I can respect. I do not disrespect people over their choice. Neither of these devices are for everyone, but both are for me. Both have a ton of pros, with just a few cons, and both are outstanding devices in their own ways. I was in that boat, but sold my Galaxy watch. Siri shortcuts are just a copy of Samsungs version, so there is no advantage to the Max there. There’s an advantage to any iOS user that wants to use them. Diss the Max all you want, but it’s an outstanding device, with just a few cons...many pros. Stop hating. I have both too and I like both but the note 9 is so much better, does way more, and utilizes it's screen realestate with split screen/windows multitasking where as the Max is just a bigger phone. It's performance is very good, the best build quality with edge to edge screen. I carry both with me daily because I just can't leave the other behind. So do I lol. Love my devices. I own both, plus a Ferrari and two Bentleys. I am more qualified to speak on forums. Until, of course, someone else owns more virtual items than me.